Background: On March 23, 2010, President Barack Obama signed the Patient Protection and Affordable Care Act (ACA) into law. The law became effective on March 23, 2012. The ACA stipulates that non-profit hospitals must demonstrate benefit to their communities through the process of community health needs assessments (CHNAs). Failure to comply with this law may result in loss of non-profit status or large fines. This report describes strategies for engaging rural communities in Internal Revenue Service (IRS)-mandated CHNAs. 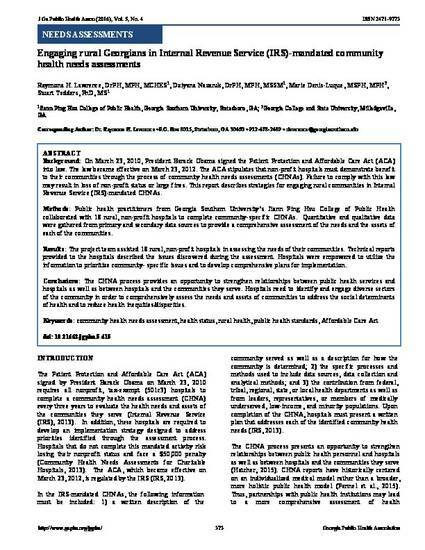 Methods: Public health practitioners from Georgia Southern University’s Jiann Ping Hsu College of Public Health collaborated with 18 rural, non-profit hospitals to complete community-specific CHNAs. Quantitative and qualitative data were gathered from primary and secondary data sources to provide a comprehensive assessment of the needs and the assets of each of the communities. Results: The project team assisted 18 rural, non-profit hospitals in assessing the needs of their communities. Technical reports provided to the hospitals described the issues discovered during the assessment. Hospitals were empowered to utilize the information to prioritize community- specific issues and to develop comprehensive plans for implementation. Conclusions: The CHNA process provides an opportunity to strengthen relationships between public health services and hospitals as well as between hospitals and the communities they serve. Hospitals need to identify and engage diverse sectors of the community in order to comprehensively assess the needs and assets of communities to address the social determinants of health and to reduce health inequities/disparities. Copyright Statement: Copyright © Raymona H. Lawrence, Dziyana Nazaruk, Marie Denis - Luque, and Stuart Tedders. Originally published in jGPHA (http://www.gapha.org/jgpha/) June 15, 2016. This is an open-access article distributed under the terms of the Creative Commons Attribution Non -Commercial No -Derivatives License (http://creativecommons.org/licenses/by/4.0/), which permits unrestricted use, distribution, and reproduction in any medium, provided the original work ("first published in the Journal of the Georgia Public Health Association...") is properly cited with original URL and bibliographic citation information. The complete bibliographic information, a link to the original publication on http://www.gapha.jgpha.org/, as well as this copyright and license information must be included.